There is something truly magical about this ice cream that turns its simplicity into pure decadence. The rich coconut and chocolate flavours are so wonderfully balanced that even if you aren’t a coconut fan you will adore it. With only 3 ingredients and 15 minutes preparation it really is easy to make. With magically rewarding results! Place the can of coconut milk in the fridge overnight to solidify. In a glass bowl, slightly wider than your pot, break chocolate into small pieces and add agave nectar. Place the bowl on top of the pot of simmering water (water not touching the bowl) on medium heat. Give it half a minute to warm up, then reduce the heat to low and start stirring with a wooden spoon. Before the chocolate is completely melted, turn off the heat and remove the bowl. Allow the residual heat to completely melt the chocolate, stirring occasionally. The process takes only 3-4 minutes. The chocolate sauce should be warm, not hot. Remove the can of coconut milk from the fridge and carefully turn it upside down so that you can open it from the bottom. Discard the transparent liquid (about 4-5 tablespoons) or store in the fridge to use later in a smoothie. Add 2 heaped tablespoons coconut milk to the melted chocolate. Whisk until well combined and smooth. Add the remaining coconut milk and whisk again until smooth. Chill in the freezer for a couple of hours. 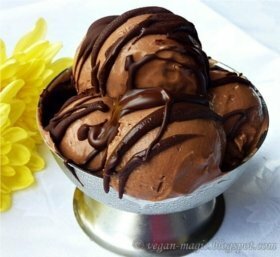 To add a little crunch, melt together 25 g dark vegan chocolate and 1 teaspoon agave nectar and drizzle over the ice cream before serving. Then set aside time to be magically transported to a land of chocolate and coconut ecstasy. 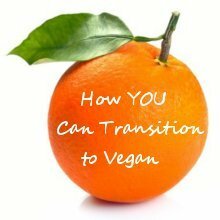 Thank you to Adriana from Vegan Magic. Please check with the author regarding © terms. 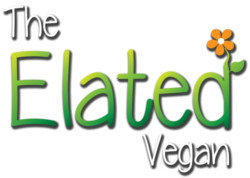 ►The Elated 1-Week Vegan Challenge! The Elated Vegan — Karen Johnson © 2018. All Rights Reserved.